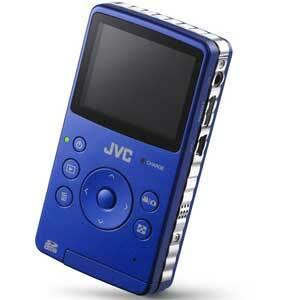 On paper, JVC’s Picsio GC-FM1 pocket high-definition (HD) camcorder is loaded. But pocket-camcorder championships aren’t won on paper, they’re won on-screen and in your hands. The Picsio GC-FM1 produced very good images in well-lit areas, but fell short in other areas. The Picsio GC-FM1 shoots 1080p video and has digital image stabilization, two positive distinguishing factors in the now-crowded HD pocket camcorder market. This pocket HD camcorder has a landscape/macro toggle, the ability to shoot still photos at 8-megapixel resolution, an HDMI-out port for viewing footage on an HDTV (no HDMI cable is included, however), and an SDHC card slot for storing videos and still images. However, the Picsio GC-FM1’s feature set is much better in theory than it is in practice. Since this device has no flip-out USB connector, you have to connect to your Mac using the included USB cable, or you can use a SD card reader—and you’ll have to remember to bring the cable or card reader with you if you’re traveling. It also falls short of its pint-size competitors in usability, durability, audio quality, and controls—and that’s frustrating, because JVC’s first pocket camcorder shoots high-quality video in bright light. The Picsio GC-FM1 turned in above-average footage in well-lit situations. It showed better highlight definition than Kodak’s Zi8 ( ) and the first-generation Flip MinoHD ( ) from Pure Digital, and its video looked a bit sharper than clips shot with the second-generation Flip MinoHD ( ). Colors produced by the Picsio GC-FM1 looked more muted and less vibrant than in footage from the Zi8 and second-generation MinoHD, and the MinoHD seemed to capture video with smoother motion. Unfortunately, footage shot in low light with the Picsio GC-FM1 is another story entirely. The camcorder was clearly outmatched by the low-light footage that the second-generation MinoHD produced. Another big drawback is the Picsio GC-FM1’s audio quality: The on-board microphone picked up a lot of hiss in our test footage, making the audio tracks for clips sound as if they were being played back on a cassette deck. I also didn’t have much luck with the Picsio GC-FM1’s digital image stabilization feature. If it worked at all, it did so only with the slightest of movements; still photos taken while I slowly moved the camcorder from side to side came out blurry. The Picsio GC-FM1 has a two-inch LCD. Speaking of still photos, the Picsio GC-FM1 in still-photo mode doesn’t have a”click” noise or any visual indication that you’ve captured a photo. The screen simply blinks a bit, and you don’t see a preview of the image you’ve just shot unless you dive into the playback menus and scroll down to find it. On a better note, the 4X digital zoom worked smoothly, and full-zoom footage looked notably better than what we’ve seen from the half-baked digital zooms on nearly all other pocket camcorders. The landscape/macro toggle on the left side of the camcorder also worked fairly well, and the macro mode worked at a slightly closer distance from the subject than did the macro mode on the Zi8. The Picsio GC-FM1 saves videos as .mov files. Video from the camcorder was imported into iMovie ‘09 and Final Cut Pro without a hitch. The software that’s pre-installed on the camcorder is for Windows only. The Picsio GC-FM1’s flashy, reflective faceplate, ribbed silver edges, and colorful back panel are all made of very lightweight plastic, and the entire device feels too light and fragile to be durable. The buttons on the back are all plastic, as well, and they’re too small for anything but the smallest hands to use effectively. You get a power button, a playback button, a delete button, a still/video toggle, a menu button, and a four-way navigation pad/record button that also controls the Picsio GC-FM1’s 4X digital zoom. The power button is not very responsive; I had to hold it down for a few seconds or press it more than once to turn on the device. The menu button isn’t entirely useful, either: It works only when you hold down the delete button while pressing it. You can toggle between the 1080p, 720p, VGA, and QVGA resolutions by tapping the left navigation button twice while the camcorder is in recording mode. On top of that, the menu options are surprisingly limited. You can adjust the time display, toggle between the PAL and NTSC formats for video-out, check your firmware version, or format your SDHC card—and that’s it. The Picsio GC-FM1’s video quality in good lighting is very good, and its highlight definition is a strong suit. However, the build quality, buttons, audio quality, and controls all detract from the device’s usability.